There are more than 1000 different pesticides in use around the world. While these chemicals are designed to target insects, weeds and other pests, residual amounts can remain on food that is subsequently eaten by consumers. The effects of pesticides on the population can be acute or chronic depending on the exposure. Acute over-exposure can cause poisoning and result in long-term effects such as cancer or reproductive issues. Chronic, lower dose exposure to pesticides has been associated with health issues such as respiratory problems, skin conditions, depression, birth defects, cancer and neurological disorders such as Parkinson’s disease. People who face the greatest risk for adverse health outcomes from pesticide exposure are those in agricultural roles, who are more likely to come into direct contact with these chemicals. However, developing fetuses, infants and children, as well as pregnant and nursing mothers and women of childbearing age are at increased risk of experiencing negative health effects due to the presence of unsafe levels of pesticides in food. Exposure throughout a child’s development¬–including in the womb, infancy, early childhood, and puberty–can be particularly dangerous, affecting hormone regulation and brain development. To minimize adverse health effects, the United States Environmental Protection Agency (EPA) and the European Union (EU) impose strict regulations on the amount of pesticides that can be applied to a crop, in order to limit the residue exposure downstream. Pesticides are assigned maximum residue levels (MRLs) depending on their toxicity, with the majority typically set at 10 µg/kg. 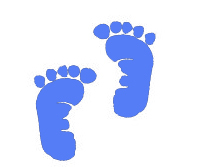 However, due to the greater risk of certain compounds affecting the healthy development of infants and young children, some pesticides are controlled further: For instance, in the EU, specific pesticides are restricted in baby foods with MRLs of between 3–8 µg/kg. In order to test foods for pesticide residues at these very low levels, food safety laboratories require sophisticated analyte detection technologies. Gas chromatography-tandem mass spectrometry (GC-MS/MS) is a powerful analytical technique that offers the sensitivity and selectivity required to detect and identify pesticide residues at levels that often go beyond those mandated by regulatory authorities, even in complex sample matrices such as baby food. Indeed, GC-MS/MS can detect multiple residues within samples at levels as low as 0.025 µg/kg, much lower than the MRLs of regulated pesticides. The sensitivity of the latest triple quadrupole GC-MS/MS systems is enabling levels of detection so low that many food testing laboratories have been able to adopt more efficient and universally-applicable sample preparation procedures based on QuEChERS (Quick, Easy, Cheap, Effective, Rugged and Safe) methods. Combining these modern GC-MS/MS systems with QuEChERS sample preparation techniques allows food samples to be analyzed directly, significantly reducing workflow complexity. Furthermore, the specificity of triple quadrupole GC-MS/MS can easily compensate for the additional matrix components or residual acetonitrile carried over from sample preparation. When it comes to the detection of pesticides in baby foods, workflows must comply with rigorous quality control and method validation standards. The EU SANTE/11813/2017 criteria outline three specific requirements that pesticide residue analysis methods must satisfy to achieve compliance. Firstly, a minimum of two product ions must be detected for each pesticide with a peak signal-to-noise ratio greater than 3 (or in case noise is absent, a signal must be present in at least five subsequent scans), and the mass resolution for precursor ion isolation must be equal to or better than unit mass resolution. Secondly, the retention time of an analyte within a sample must not differ by more than 0.1 minutes compared with standards in the same sequence. Finally, the relative ion ratio for each analyte must remain within 30% of the average of calibration standards from the same sequence. Fortunately, modern triple quadrupole GC-MS/MS systems are ensuring food safety testing laboratories comply with these criteria. In terms of peak detection and resolution, the specificities achieved using the latest triple quadrupole instruments meet or exceed the EU SANTE requirements by providing consistent data points regardless of sample preparation approach or matrix type. Precise detection at the ultra-low concentrations required for pesticide residue quantitation is routinely achieved using modern triple quadrupole GC-MS/MS systems, with analyses offering qualitative identification of each analyte among a large group of residues. Furthermore, the latest systems deliver stable ion ratios that are well within the required 30% range at the default 10 µg/kg MRL across multiple injections. In a recent study that put the capabilities of the latest triple quadrupole GC-MS/MS systems to the test, samples of baby food (carrot/potato and apple/pear/banana) spiked with a mixture of more than 200 pesticides at three concentrations (1.0, 2.5 and 10.0 μg/kg) were analyzed using the Thermo Scientific TSQ 9000 triple quadrupole GC-MS/MS system fitted with an Advanced Electron Ionization (AEI) source. Prior to injection into the instrument, the homogenized spiked samples were prepared for analysis using a QuEChERS method that included an acetonitrile extraction step, a clean-up step involving primary secondary amine (PSA) and dispersive solid phase extraction (dSPE), followed by acidification with 5% formic acid in acetonitrile. The triple quadrupole GC-MS/MS system met all SANTE criteria at the three spiking concentrations in both food matrices. More than 97% of the target pesticide residues in the 1 μg/kg spiked sample had recoveries in the range of 70%–120%, highlighting the broad applicability of the method. 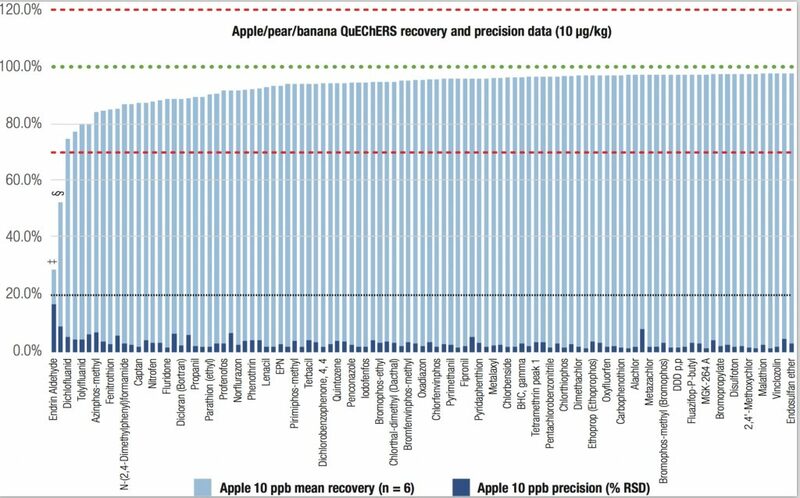 The recoveries of the target pesticides from the apple/pear/banana sample spiked at 10 μg/kg are shown in Figure 1. Figure 1. 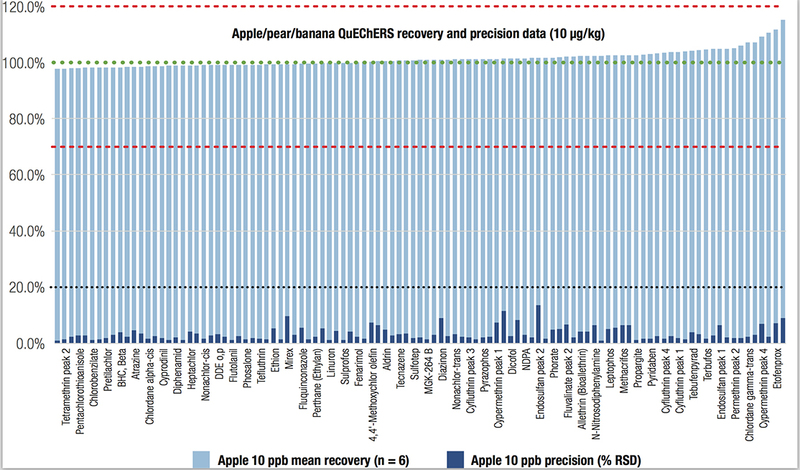 Recovery and precision data for apple/pear/banana extractions (n=6) at a concentration of 10 μg/kg, obtained using TSQ 9000 triple quadrupole GC-MS/MS system fitted with an advanced electron ionization (AEI) source. To determine the limits of detection of the system, baby food samples prepared by the previously-described QuEChERS method were spiked with the same mixture of pesticides at 14 concentrations ranging from 0.025 to 250 μg/kg. Using the triple quadrupole GC-MS/MS system, the SANTE criteria were met for all of the pesticides targeted at the default MRL of 10 μg/kg. Additionally, more than 90% of the target compounds had a limit of identification (LOI) satisfying all SANTE requirements below 0.5 µg/kg, and more than 60% of the target residues met these criteria below 0.1 µg/kg (Figure 2). Figure 2. Number of target residues satisfying the EU SANTE requirements (carrot/potato sample matrix). IDL, instrumental detection limit; LOI, limit of identification. Instrumental detection limits (IDLs) were also determined for each pesticide residue by performing 10 replicate injections of the lowest matrix-matched standard of carrot/potato that met all SANTE criteria. IDLs were then evaluated using one-tailed student t-tests, taking into account the concentration and absolute peak area %RSD for each compound. 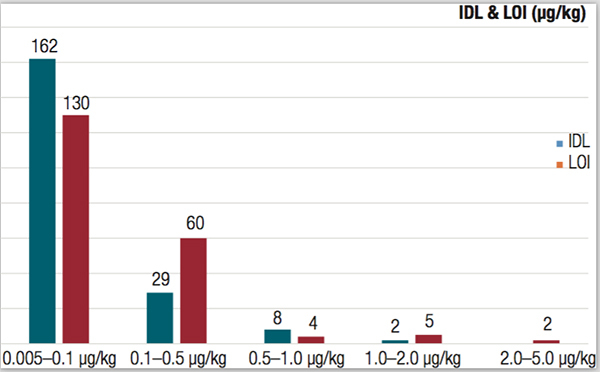 The evaluated IDLs ranged from approximately 5 fg (for chlorobenzilate) to 2.0 pg (for bioallethrin), with over 95% of the residues exhibiting an IDL of less than 500 fg on the column (equivalent to 0.5 µg/kg in each sample extract). These results highlight the exceptional performance of the system, offering quantitative analysis of more than 200 pesticides over up to five orders of magnitude. Enforcing regulations on the amounts and types of pesticides used is essential to limit our exposure to safe levels. The latest GC-MS/MS systems are capable of detecting and identifying pesticide residues at levels far beyond those required under regulatory standards, helping food testing laboratories efficiently ensure the food our children eat is always safe to consume.